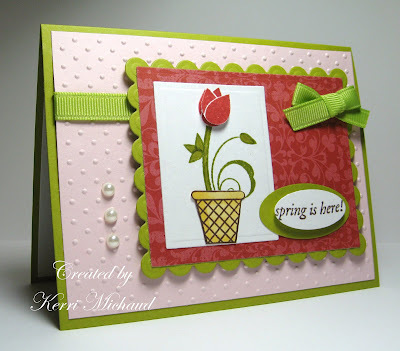 This week's Fun-Frilled theme is Spring! When I think of spring, I think of flowers, especially tulips : ) I used Verve's Miracles Blossom set once again. Isn't it just so fun! I stamped the tulip twice with Ruby Red, cut one out, and popped it up on foam squares. I stamped the leaves and stem with Old Olive and colored it in with a Pale Olive Copic Marker. The planter is stamped with Chocolate Chip and colored in with a Buttercup Yellow Copic. The sentiment comes from Penny Black's Garden Friends set (borrowed from my friend and neighbor) and I stamped it with Chocolate Chip and punched it out with SU Oval Punches. I'm trying to catch up on my Viva La Verve sketches so I followed the Mar02 sketch for my layout. The base is Kiwi Kiss, and I used my CB Swiss Dots Folder on the Pink Pirouette layer. The dp is from SU Bella Rose DSP. Thank you so much for stopping by today, and please play along to be eligible for Michelle's awesome blog candy!!! This is really cute, Kerri. I love spring and all the new life that comes with it! Just stunning! I love the color hues you used. Makes it just POP! Beautiful design! So springy and fresh!